Hi to all you WHS 1959 golfers out there. 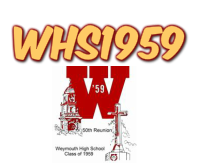 We have reserved the Atlantic Country Club in Plymouth on Friday, September 25 for our golf event as part of our 50th Weymouth High School Reunion weekend. We will meet at the club at 8:00 to warm up and then tee off at about 9. We will meet afterwards for lunch at the club. Atlantic Country Club is a beautiful course out in the country with rolling hills and a nice clubhouse. The course is of moderate difficulty we think that you will like it. Ted and I drove around many of the holes and it is beautiful There is more information about the club with pictures and directions on their website at www.atlanticcountryclub.com. We can form our own foursomes or the committee will arrange foursomes on the day of the tournament. We plan a best ball format (scramble) with minimum modifications.. Ted and I will be playing from senior tees and will be looking for a fun day. Our distance off the tee seems to go down every month. 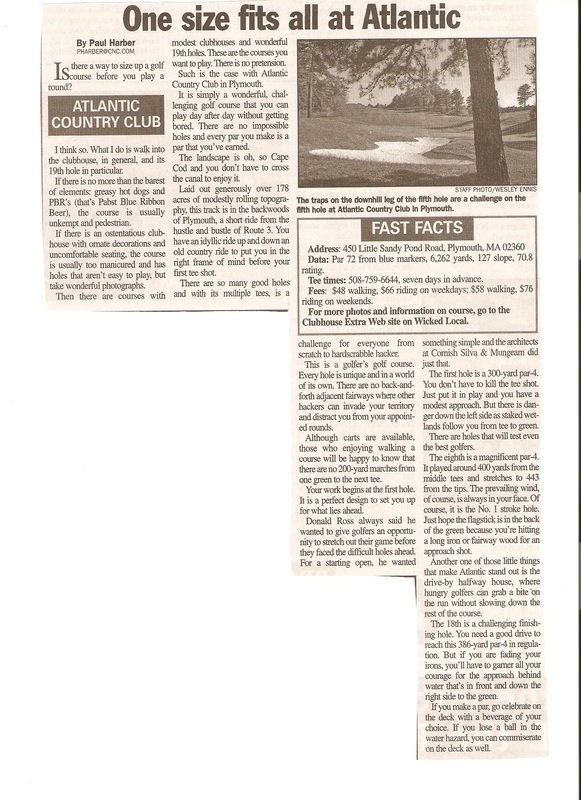 If you are anticipating cutthroat competition and you want to play the pro tees- go for it. The price of $80.00 includes range balls, greens fees, golf carts and lunch. We are collecting a non-refundable deposit of $40.00 up front. The balance of $40.00 is due at the golf course on the 25th. We need a final count of participants by September 9 so that is a cutoff date for your deposit. Please get your deposit in early before you forget and risk missing this momentous PGA sanctioned event. Spouses are welcome. If you would like to invite and sponsor and pay for a former teacher or coach, please feel free to do so. We are collecting email addresses to facilitate communication. I will be glad to answer any questions. You can call or email Ted or me. See you at the Atlantic Country Club. Just kidding about the PGA.